Landrace accessions have long been recognized as an important source of genetic diversity for crop species, and landraces are stored in genebanks across the world as genetic resources for future crop development. Landraces are also an important part of the human cultural heritage and as such they have been used for genetic studies to make inferences about historical agriculture. However, surprisingly little is known about the within-accession diversity of landrace crops of different species. In order to evaluate the diversity of Swedish landraces we used microsatellite markers to genotype accessions of four species (barley, pea, oats and rye), both extant genebank material and 114-year-old seed samples of similar geographic origin and type. We found consistently high levels of within-population genetic diversity in the historical material, but varying and often lower diversity levels in the genebank accessions. 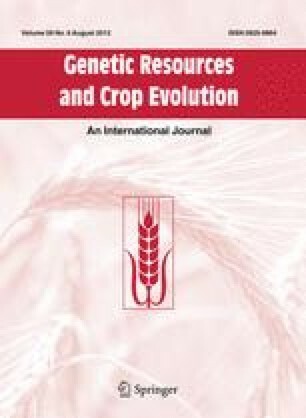 We also make tentative conclusions about how representative the genebank material is to what was originally cultivated in its reported area of origin and suggest that the true identity of the genebank accessions is unclear and that historical seed collections should be a more appropriate material for the study of historical agriculture. The online version of this article (doi: 10.1007/s10722-011-9754-x) contains supplementary material, which is available to authorized users. The authors would like to thank the Nordic Genetic Resource Center (NordGen) for providing seed material. This work was supported by the Lagersberg foundation, the Swedish Research Council for Environment, Agricultural Sciences and Spatial Planning (FORMAS), Carl Tryggers Foundation, the Nilsson-Ehle foundation and the Helge Ax:son Johnsson foundation.